This is an exceptionally wide-ranging 1859 instructional manual issued by the Admiralty for the mid-Victorian Navy. It covers the Navy's fighting men - sailors and Marines - and the correct use of their weapons and firearms. There are chapters on rifle, manual and platoon exercises; the forming up of a shore company and light infantry movements. Their Lordships have even borrowed an extract from the Army's Musketry Instruction manual on target drill and practice. 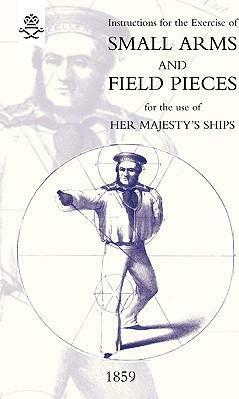 There are additional chapters on cutlass exercises; and on training with the pike, pistol and bayonet. A concluding chapter deals with the use of 12- and 24-pdr howitzers and other field artillery pieces.